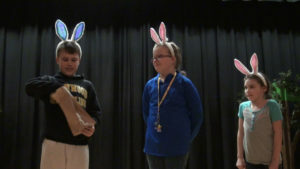 Kids Take the Stage provides students the opportunity to develop leadership skills through self-expression and drama. Sessions meet after school one day a week and include activities, games, improvisation, vocal skills, pantomime, acting skills, stage direction and more. Students will learn how to audition and work together to put on a show. At the end of the program students will perform a play for their parents and friends. This program is usually provided for students in grades three through five. LTD has provided programs for middle school and high school students in the past and if the need arises, will offer programs to those age groups. Though LTD is based in Mills County, Iowa, it has worked with schools and arts centers in the surrounding counties to provide this program. Middle and high school students interested in theater are encouraged to become LTD mentors and work with the younger students.